A Christian parish has nothing to offer the world except Jesus Christ – the One in whom we live and move and have our being (Acts 17:28). We have nothing to offer each other except Christ, and the love with which He loves each of us (John 13:34). When as a community we take our eyes off Christ, and make anything else our message or our concern, we are lost in the darkness of the world. 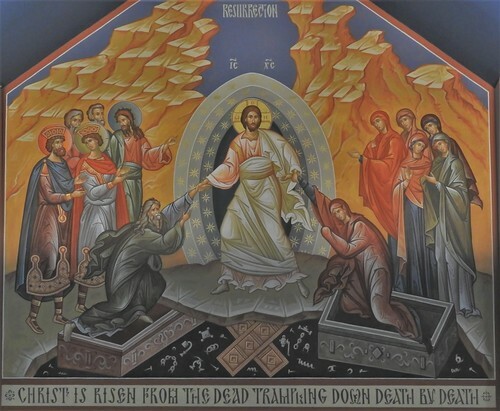 On Pascha, we see Christ risen from the dead, shining out of the darkness of Hades itself, calling each of us personally and all of us together to lay aside our worldly cares and way of seeing each other. Out of the darkness of the night, out of the darkness of our hearts, out of the darkness of our minds, the light of Christ shines. That can only happen when “I” no longer live but Christ lives in me (Galatians 2:20). It is on this day that we put aside every work, when our soul beams with joy from relaxation; most important of all, we have enjoyed innumerable blessings this day. 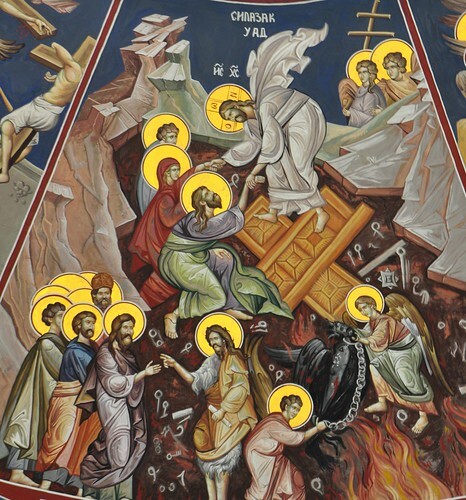 For on this day death was abolished, the curse was erased, sin disappeared, the doors of Hades, were broken into pieces, the devil was imprisoned, the long-lasting war ended, and reconciliation between God and men happened. And our race returned to its former, or better yet, to a much greater nobility, and the sun beheld that marvelous and paradoxical sight — man being born immortal. He wanted to remind us of all these events and other similar ones, and he brought the day before all, taking only this day as an advocate, and he says to everyone: “Just think about how many and extraordinarily great blessings you benefited from on this day, O Man; from how many evils you were delivered, who you were before and who you have become since these things. If on our birthdays we, and many house-slaves on these days on which they were freed, celebrate these events with great honor, and the former holds banquets while the free even give gifts, and they all very much honor those specific times, much more so must we honor the Day of the Lord, which one would not err in calling the birthday of all of human nature. For we were lost and then found, dead and alive again, enemies and then reconciled.” For this reason, it is fitting to honor it with spiritual honor — neither to hold banquets, nor to pour out wine like water, nor to get drunk and dance, but rather to render great abundance to the poorer of the brethren.